Here at StickerYou we like to make what matters stick. But what goes into our sticky matter? It’s an excellent question. While the world’s first stickers appeared in ancient Egyptian markets when vendors used a wheat-based adhesive to stick colored paper on walls to advertise their wares, today’s stickers are a little more complex. Most modern stickers are a combination of three distinct layers: adhesive, surface and coating. And each layer plays an important role in the quality of the end result. Below, we walk you through each layer of our humble, customized die-cut sticker. There is nothing more annoying than a sticker that just won’t stick. Which is why the adhesive layer of the sticker is so important. The adhesive layer of the sticker is what bonds it with the surface that you stick it on, whether it be a laptop, cellphone or a subway station wall. But not all adhesives are created equal. The strength of an adhesive is measured in Newtons, which means that it is measured in the amount of force necessary to break the adhesive bond with the surface it is stuck to. Named after Sir Isaac Newton, they are a Standard Unit of Force, under the International System of Units, and measure the amount of force necessary to accelerate mass in the direction of the applied force. So one Newton is the amount of force needed to accelerate one kilogram of mass at the rate of one metre per second squared in the direction of the applied force. What does this mean for sticker adhesives? It means that with an adhesive of 300 Newtons, which is the adhesive strength of our customized, die-cut stickers, you’ll need roughly 67 pounds of applied force to pull it off. Our permanent stickers and labels are even stronger, at 1,000 Newtons. Which means what you’ve stuck will stick, until it’s time for you to remove it. 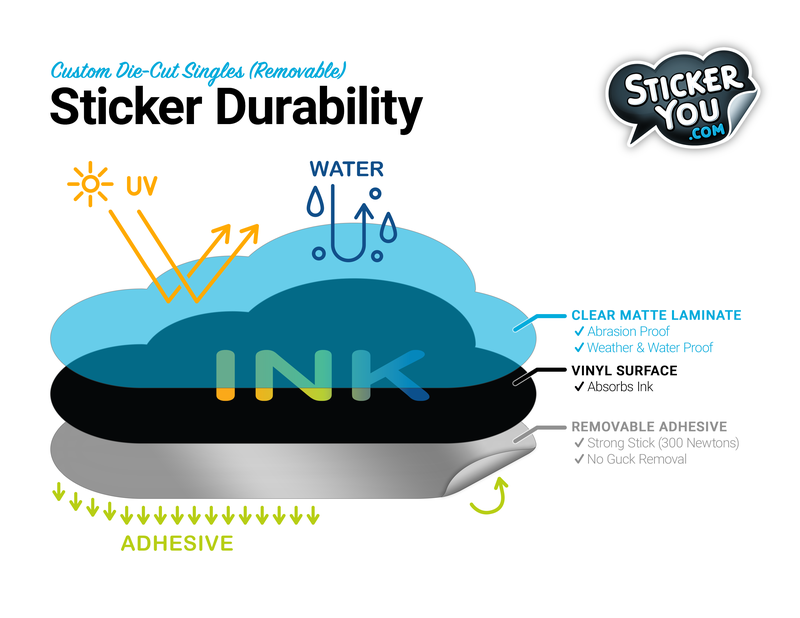 Speaking of removing stickers, another key feature of the adhesive that we use for our customized die-cut stickers at StickerYou is that it is easily removable. So no gunk or ripped bits of sticker left behind when you apply your 300 Newtons to remove it. The surface is the layer that your customized design is actually printed on. The surface layer of stickers are either made from paper, or from vinyl. Paper stickers may look good, but they don’t last long, which is why they are often used in packaging. Paper stickers don’t require laminate, and are at the mercy of the elements, which means that they fade, rip and smudge easily. Not so with vinyl stickers, which is why all of our custom-designed stickers are made from a thin layer of vinyl. Vinyl stickers are easy to clean and the colors don’t fade, making them perfect for indoor and outdoor use. Oh, and they last a very long time. Raw vinyl is thin, and thin stickers can be difficult to remove, as they rip and tear easily. 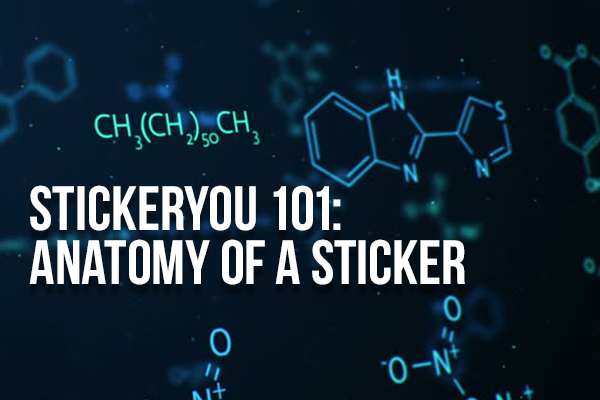 Which is why the final layer of laminate is the key to creating a sticker that looks great, lasts long and is easy to take off when you need it gone. The vinyl sticks to the laminate when you remove the sticker, not to the surface you’ve stuck it on. Our die-cut singles are laminated with a clear matte coating for extra protection and durability. On top of that, the clear matte laminate is waterproof and offers UV protection, which is essential in retaining bright colors and keeping the sticker in great shape. The laminate coating also works to keep the colors on the vinyl from bleeding out or splashing during the printing process, so the edges of your designs stay clear and sharp. Want more great ideas and inspiration? Follow us on social, or sign up for our newsletter for amazing deals delivered directly to your inbox. StickerYou blog posts are written and published by members of the StickerYou team at our headquarters, located in the beautiful city of Toronto, Canada.